Let us see what we have planned for the next two weeks. A lot of prep work for Christmas (baking, knitting, Christmas Cards, Christmas shopping, cutting down and decorating the tree), the regular day job and there is some freelance work thrown in too. 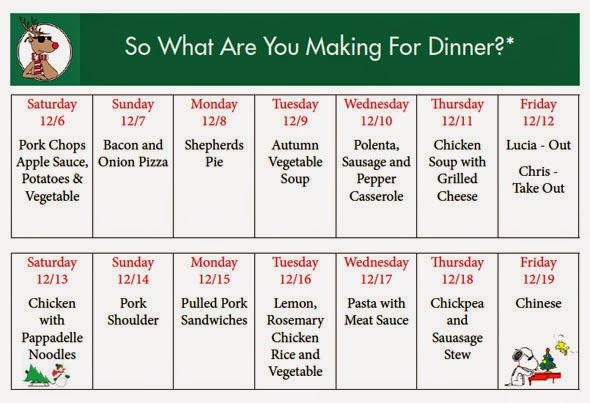 I thought if I plan our menu for 2 weeks, after all I get paid every 2 weeks, it might be one less thing I would have on my plate, no pun intended. I think I'd rather eat dinner at your house than mine!